Are you thinking of going to massage school? It is a big investment of time, energy and money, so before you dive in, do your research. Ask other massage therapists about the realities of the workplace–starting salaries, what they love (and hate) about being a massage therapist, and what are the qualities that are required for success in the field. Being a massage therapist can be a satisfying line of work. You work one-on-one with people. You are helping them feel better, which can be very rewarding. Learning how the body functions and what you can do to relieve pain is intellectually stimulating. And there are so many modalities to learn that you can always be enriching your knowledge and skill. A lot of massage therapists are absolutely in love with their work and can't imagine doing anything else. But being a massage therapist does have some downsides. It is a physically demanding work with a big burn-out rate. In a spa setting you might give five to as many as eight massages a day. Many massage therapists stop working after two years because their body can't take it, and others go to part-time work. Another cause of drop-out is they can't make enough money. Men have a hard time getting work–some spas have even gone to 100% female staff–and once they're hired, getting booked. Most female massage therapist have had unpleasant experiences with male clients who want a happy ending or otherwise behave in an inappropriate manner. Here are some things that should be on your checklist when you're thinking about a career in massage therapy and evaluating massage schools. Will I Be Able To Find Work? 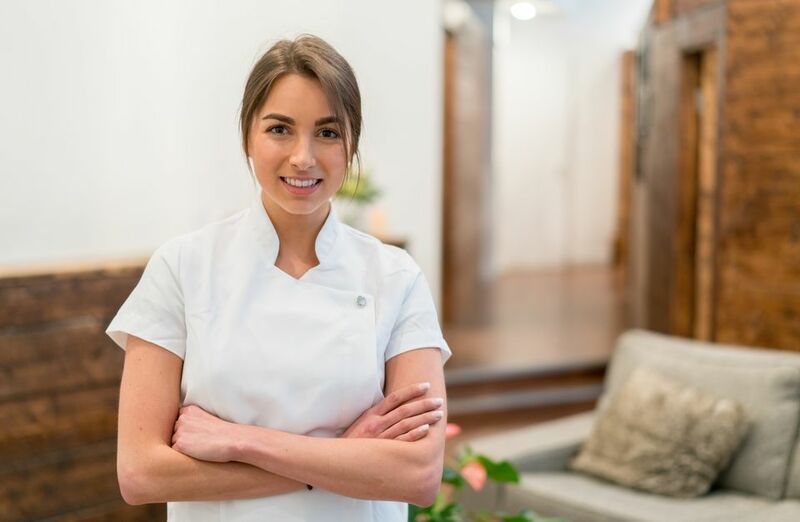 There is a higher demand at spas for massage therapists than estheticians, so it's likely that you will be able to find work somewhere. More people understand the value of regular massage therapy. In particular, chains like Massage Envy have opened expanded the market for affordable, regular massages. The downside is what massage therapists make per massage is less in that setting. Massage schools are in the business of attracting new students. They’re selling themselves! Don't believe them if they say you’re going to make $50,000 or up right out of school. It's not easy to get a job at a highly desirable hotel or resort, even with experience, and it can be highly seasonal work. Building your own practice takes time and isn't realistic for most new grads. You’re better off believing what other massage therapists and spa directors say about starting salaries in your area. Do your own research. Massage school has also gotten much more expensive in recent years, which means your investment is higher. Talk to people you know who are in the spa business and ask them to recommend massage schools in your area. Massage therapists are especially helpful. Call the spa owners or directors at spas where you would like to work and ask which massage school they like to hire from. That will give you a good idea which massage schools have the best reputations. Look for massage schools in the state where you want to work. Each state has its own licensing practices and the massage schools can give you more information on the licensing requirements in your state. Here are two of the best places for searching for massage schools. Once you narrow down your list, call the school for an initial phone interview. Massage schools have an admissions department that can answer your questions and send you an information packet. Ask staff about licensing requirements in your state, the curriculum, how much it costs, full and part-time programs, and financial aid. It’s also very important to make an on-site visit to the massage school. Do you like the atmosphere? Do the teachers impress you? Talk to students while you’re there and ask what they think (away from teachers or admissions counselors.) Some schools have an open house or free workshops so you can get a feel for massage therapy in general and the atmosphere at the school. All massage schools will teach you what you need to know to pass the state licensing exam. But ask about their philosophy and approach. Do they combine theory and practice from the beginning? How long have their teachers worked there? Do they have classes in Eastern modalities like Shiatsu? What is their continuing education program? Ask the massage schools for names and phone numbers of graduates. Call them to get get a candid assessment of the strengths and weaknesses of that school. Ask about the job market, starting salaries and what it’s like in the real world.